Ten years later and one hurdle leapt – there will be more. Last week the 10th U.S. Circuit court of Appeals upheld the 2001 Roadless Area Conservation Rule after the state of Wyoming and the Colorado Mining Association brought suit claiming the rule was in violation of the law. 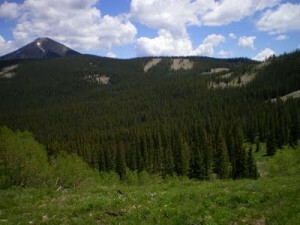 The Roadless Rule, which imposed restrictions on logging, mining and road building in roadless areas within our National Forests was one of the last hurrahs of the Clinton administration – published in the Federal Register on January 12, 2001. However, soon after George W. Bush was sworn into office January 20, 2001, new White House Chief of Staff, Andrew Card issued a memo instructing all Cabinet Secretaries to delay all last minute rules and regulations put into place by the Clinton administration. On May 10, 2001 Federal Judge Edward Lodge issued a preliminary injunction barring the rule from taking affect. Then in a strange turn of events the Bush administration actually defended the Roadless Rule in August of 2002 and in December of 2002 a federal appeals court reinstated the rule. But the ping-pong ball didn’t stop there. In 2004 the Bush administration proposed a new rule to replace the old Roadless Rule, offering Governors a petitioning process allowing them to manage roadless areas within their state. Since that time the ping-pong game has raged with various, seemingly conflicting federal court rulings, at times upholding and at times overturning the new Roadless Rule. In August 2009, the Obama administration, in support of the national roadless rule appealed a Wyoming federal district court ruling. That appeal went to the 10th circuit Court of Appeals in Denver and on October 21, 2011 the 10th circuit Court of Appeals reversed the Wyoming decision. This decision is certainly great news for wildlands, wild ecosystems, wildlife and the people who support and revere all of the above. And while it is surely a decision to celebrate, it is not the be all – end all. Both the Governor of Wyoming and the Colorado Mining Association are mumbling about an appeal. There are two things certain. The original Roadless Rule of 2001 was one of the most publicly vetted policy initiatives of all time. There were over 600 public meetings and 1.6 million comments received by the Forest Service. The next greatest number of public comments for any type of policy initiative was 275,000 in 1998 regarding organic food standards. And of the 1.6 million comments, more than 90 percent favored the rule. So there is little doubt about how the public feels regarding the protection of our wildlands. The second thing that’s sure is there are plenty of deep pockets that see those wildlands as profit-producing commodities and deep pockets always seem to have a prominent place at the table when it comes to public policy. This one is going to the Supreme Court.